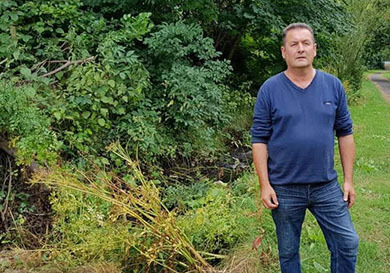 Sinn Féin Mourne’s Councillor Willie Clarke has made representations to the DFI Rivers Agency requesting that the small waterway in Islands Park in Newcastle, be dredged. Councillor Clarke said: “The Islands Park waterway requires clearing of silt deposits which have built up in the channel, which is restricting the flow of water. Cllr Willie Clarke is calling for a clean up of the Shimna River at the Islands Car Park area in Newcastle. “The Rivers Agency need to clear the debris and the vegetation blocking this flow. The material includes a considerable amount of litter which has accumulated over a number of months, and Council cleansing officers will need to work in partnership to remove the litter. “As well as being unsightly, and increasing the risk of flooding, I have concerns regarding the associated smell and the potential for vermin infestation. I will continue to engage with council officers and Rivers Agency staff to ensure the appropriate maintenance measures are taken,” added Cllr Willie Clarke.